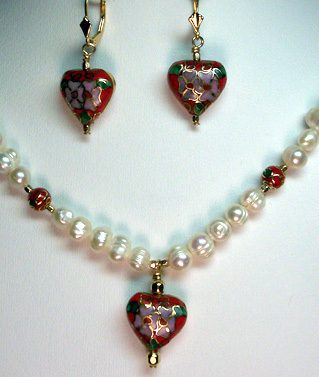 Necklace of baroque Fresh Water Pearls, Red Cloisonné balls, and 14 kt. Gold Filled beads, centered by a 16-mm Red Cloisonné Heart pendant, hand strung on silk thread finished off with 14 kt. Gold Filled findings, extender chain and lobster claw clasp. Earrings pictured can be found in the earring section.